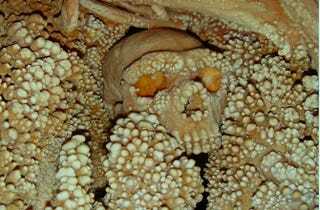 The oldest samples of Neanderthal DNA have been extracted from remains embedded in a cave in southern Italy, confirming that the so-called Altamura Man was a Neanderthal who lived around 150,000 years ago. Consisting of a virtually complete, fossilized hominin skeleton in an excellent state of preservation, the Altamura Man was discovered by a group of speleologists in 1993 in the karstic cave of Lamalunga, near the town of Altamura in Puglia. The area is rich in prehistorical findings, including a trail of dinosaur footprints. Video: Could Neanderthal Talk Like Us? The remains “represent one of the most extraordinary hominin specimens ever found in Europe,” Giorgio Manzi, professor of paleoanthropology and human ecology at Rome’s Sapienza University, David Caramelli, associate professor of anthropology at the University of Florence, and their colleagues wrote in the Journal of Human Evolution. “It is of great interest that mtDNA was sufficiently preserved to permit paleogenetic analysis,” they added. The Altamura Man was found by chance when cavers spotted a 26-foot-deep well. Inside was a tunnel that opened into a large cavity, with other tunnels branching out from it. One of the tunnels, about 200 feet long, led to another cave, rich with stalagmites. There, encrusted in a corner and looking like a large piece of coral, was a skeleton lying on its back. Only the skull, which appears upside down, and part of a shoulder were visible. The rest of the body is incorporated into calcite concretions. Researchers assume the unfortunate hominid fell in a well and remained trapped there, dying of starvation or from lack of water intake. The skeleton was then covered with droplets of limestone that helped preserve it for millennia. “Although other fossil samples of Homo neanderthalensis can be found in Europe and the Near East, none can equal the excellent state of preservation and the completeness of the Altamura Man,” Manzi said. The cave’s remoteness and the fossil’s condition have meant that since the discovery, the Altamura Man has remained undisturbed. “For many years after its discovery, the only information we had on this extraordinary fossil skeleton was based primarily on on-site photographs and observations, which were biased by the presence of calcite formations,” the researchers wrote. Beginning their work six years ago, Manzi and colleagues finally obtained permission to remove a piece of bone from the skeleton. “The sample consists of the articular portion of the right scapula,” Manzi and his colleagues said. “In contrast to most of the bones of the main assemblage, it was free from major concretion apart from a superficial film of calcite,” they added. Morphometric examinations and bone DNA analysis confirmed the Altamura Man was a Neanderthal, the species that inhabited Europe between 200,000 and 40,000 years ago. More precisely, the hominin is estimated to have lived approximately 150,000 years ago, in the late-Middle to early-Late Pleistocene — an ancient phase in the existence of Neanderthals. Indeed, uranium-thorium dating of the sample and other fragments of stalactites revealed that the calcite concretions started to accumulate on the rocks and skeleton between 172,000 and 130,000 years ago, in the middle of the second last quaternary glaciation. “The results of the paleogenetic analysis have indicated the presence of endogenous DNA, even if highly fragmented,” Caramelli said. “These first genetic data allow, among other things, to consider the Altamura skeleton as the most ancient Neanderthal from which portions of genetic material DNA have been extracted and, as such, a highly suitable candidate for interesting genomic analyses,” he added. This article originally appeared at Discovery News and is republished here with permission.